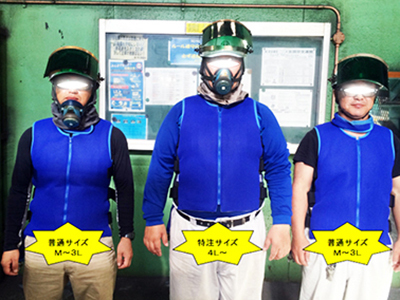 Industry Applications vol.1 Iron & Steel Industry - COOLEX The Ultimate Protection Against Heatstroke in Extreme High Temperature Environments - Kamakura Seisakusho Co., Ltd.
Iron and Steel Industry Breakthrough cooling workwear saves you from extreme high temperature work environments! 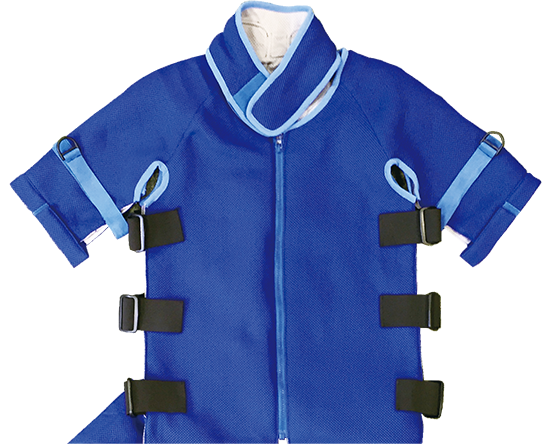 COOLEX effectively cools the wearer's body with the constant flow of cold water in extreme high temperature working environments. Portable and for use anywhere with an AC electric power outlet. COOLEX directly cools the wearer, making it a highly efficient and effective cooling solution. Effectively cools even in workplace intense heat.COOLEX allows you to work more comfortably and ultimately, more efficiently. Fire-retardant option for workplaces with fire hazards. We do gas fusion cutting work. This entails three hours of staying in the same place while working with the high heat of gas cutters. For both cooling and protection against dust, an air blower blows on the operators from above, but when the hot season comes in full swing, the cooling effect is limited. 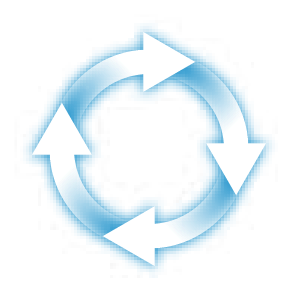 While we wanted to increase these gas fusion cutting processes in the future, we had to think about improving the site so the operators would not have a drop in productivity. We got a couple of demonstration units and carried tests out at the site. The operators said their necks and backs were kept cold and they could work comfortably with them on, so we decided to go with them. We did have to make special modifications to fit our larger employees. The COOLEX system cools well, especially around the neck. We are fully satisfied with them as a measure against heatstroke. This also brought about a new demand for something that will help with winter work. 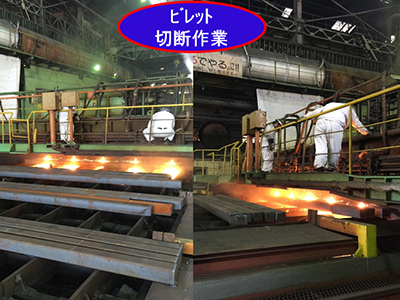 Base metal ingot cast cutting with thermic lances. We work indoors and room temperature gets considerably high, especially in the summer. 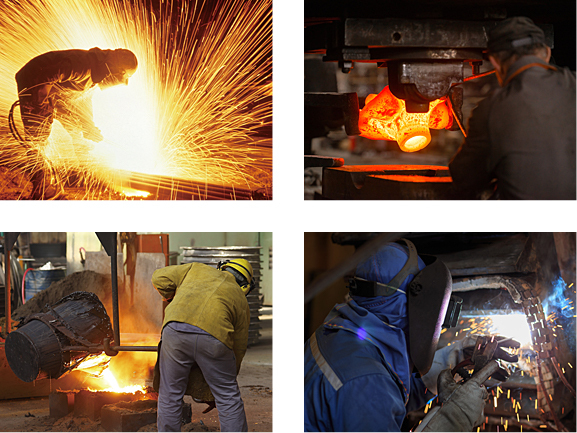 Sparks fly so we need to wear cotton or flame-retardant / non-melting clothing at the workplace. Steel scrap cutting with acetylene fusion cutters. 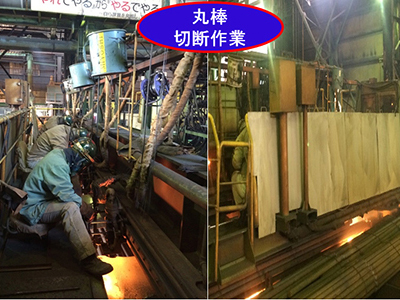 This work is done outside and workers get extremely hot because of direct exposure to sunlight on top of the cutting work in addition to the heat source of cutting work process itself. 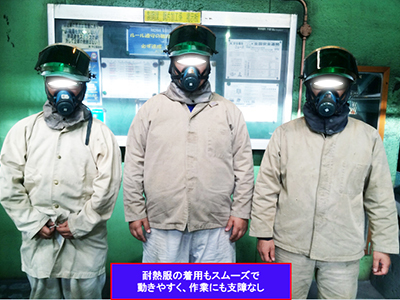 We have been actively working on taking measures against the heat, but we couldn't use fans because of the danger involved with flying dust and sparks. We got our first introduction from a circulation by the cooperative association for heatstroke countermeasures. A company (HOKUSAN Service) ,which carries out contract work on the premises, managed this project, and after completing various tests and confirmations below, we finaly decided to implement COOLEX. Cooling effect is excellent. The hose length is 8m, and then we installed the chiller where there is no direct sparking. For outdoor work, we also use optional "Hose balancer" and "Chiller wagon", and we are improving workability and devising ideas so that the hose does not run on the ground.